Just the name of this dessert makes me feel warm and fuzzy all over. A super easy dessert that is sure to wow your friends and amaze your family, and quite possibly even those hard to please folks. I mean, who doesn't enjoy a good custard every now and again? Whatever the situation or who's coming to the table, this dessert is sure to score some brownie points. Preheat oven to 350°F. Arrange 8 (½ cup) ramekins into a baking dish. 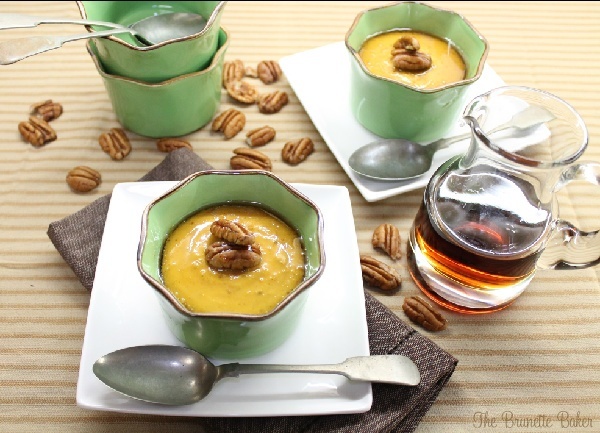 In a large bowl, whisk together egg yolks and pumpkin pie filling until well blended. Add in cream and whisk until ingredients are completely incorporated. Carefully pour pumpkin mixture into ramekins, ensuring an even pour. Place in oven. Slowly pour enough hot water to come halfway up the sides of the ramekins. I did this step backwards to show how high the water level should come. Bake 40-45 minutes. Custard will be slightly jiggly in the middle. Remove ramekins from the water and allow to cool. Serve warm or at room temperature. Sprinkle each custard with with warm maple syrup and dollop with whipped cream or toasted pecans - or both.